Training the Mind through Yoga contains guidance of great value to those on the path of inner discovery. 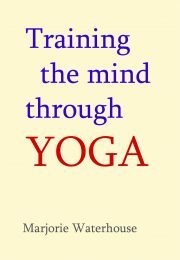 The Training the Mind through Yoga is one of three books by her. The others are The Power Behind the Mind and What Yoga Has to Offer. These books are ideal reading if we have started to seriously reflect on the teachings and to do meditation and related practices with interest.